The Bear and I took advantage of an April daddy-daughter weekend to visit a new (to us) museum, the Empire State Aerosciences Museum in Schenectady, NY. 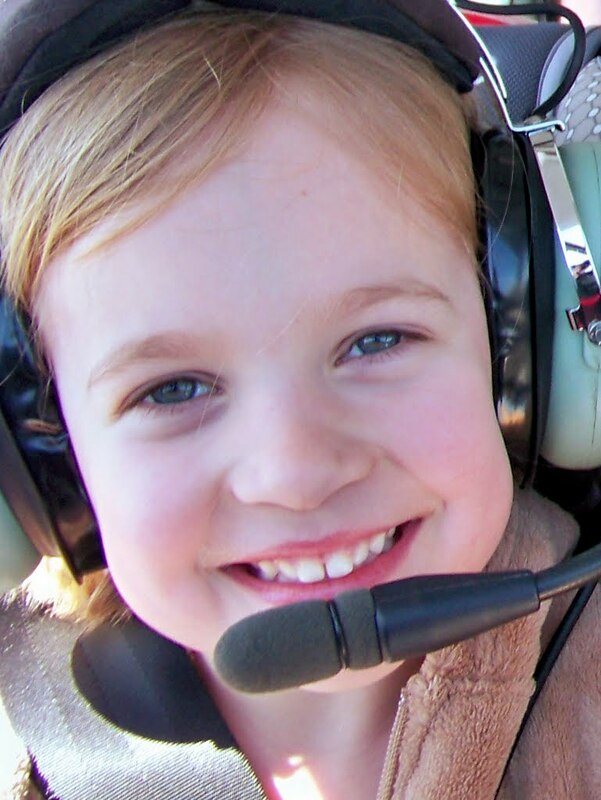 It was also our first long flight with just the two of us and the first out of the area with the new avionics. Our first crisis came shortly after cranking the engine when The Bear said, "Daddy, can you wipe this red stuff off of my MobiGo?" I turned and saw that she had a paper cut on the tip of her finger and had bled all over her handheld electronics and her coat. I tore the cellophane off of a first aid kit that I put in the airplane two years ago, used an alcohol wipe to clean up her finger and the MobiGo, applied a bandage, and told some jokes to counteract the falling tears. Disaster averted. 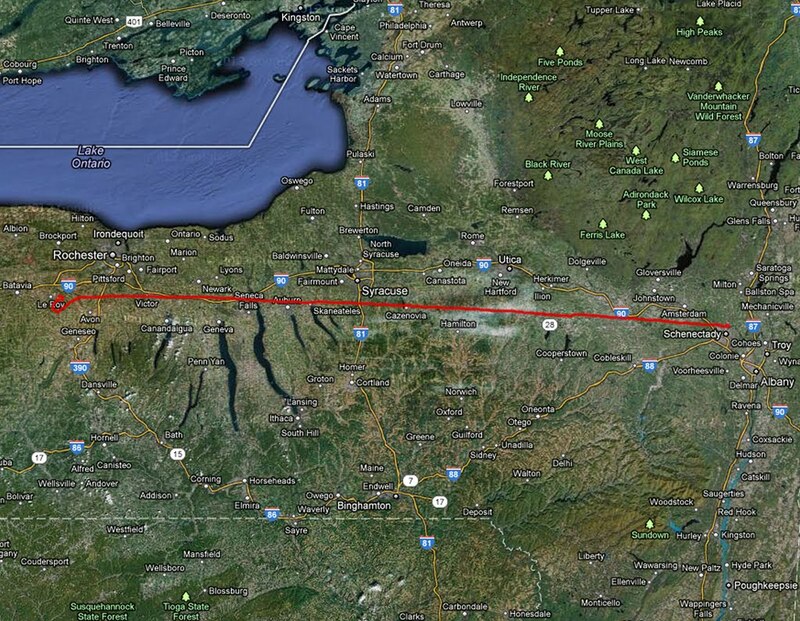 We flew over the north ends of most of the Finger Lakes. I played tour guide for The Bear, teaching her the name of each as it passed below. "Cayuga" garnered a big laugh from The Bear. I think the only thing she retained is that one of the lakes is shaped like a "Y", but that is a great start. We landed at Skaneateles Aero Drome (pronounced "skinny atlas"), a picturesque country airport on the shore of Skaneateles Lake, for fuel ($5.40/gal). 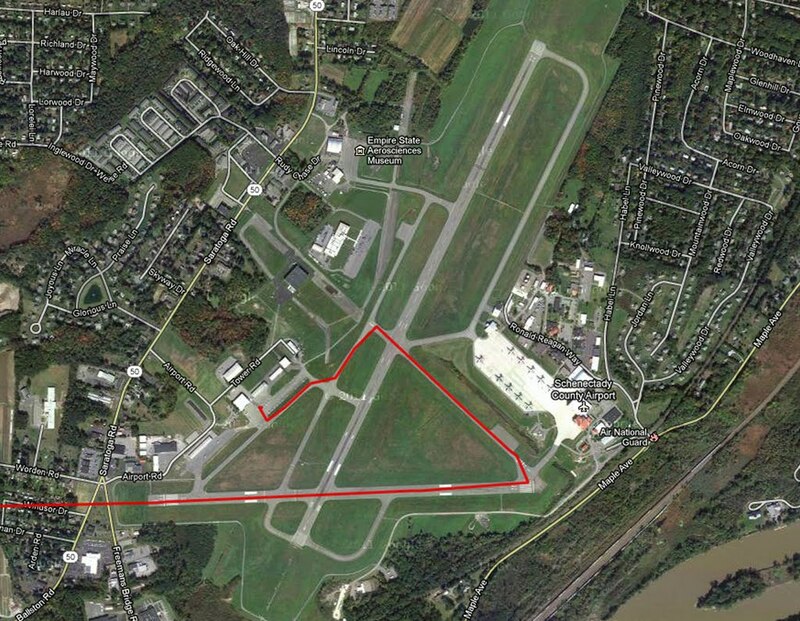 While flight planning that morning, I discovered a NOTAM that the grass runway was closed until mid-May. I could not help but wonder if the closure was directly triggered by the stuck Husky from several weeks before. We turned left base for runway 28 while over the lake. The dark blue of the lake water contrasted sharply with the pastel land features. Only one other airplane stirred at Skaneateles that morning, but it departed shortly after we landed. Once refueled, we went in search of a restroom. The field is dominated by two large hangars. We ventured inside the old terminal building attached to the rear of the westernmost hangar. It was dark, quiet, and mostly empty inside. A counter still divided the lobby space, but it was also empty. One hallway led into the hangar. Light admitted by the large, multi-paned windows along the walls revealed a large, modern twin and two beautiful Stearman biplanes. A second exit from the terminal lobby admitted us into a dark hallway. As we explored, The Bear became spooked and clung to my leg. She relaxed a bit when I found a lightswitch and filled the space with dim fluorescent lighting. Most of the closed doors opened onto small bedrooms, some of which still had beds. Crash pads? Finally, relief - the last door we tried was a bathroom. There was a placard above the urinal that read "Ladies". Funny...I guess. Back in the air, we contacted Syracuse for flight following and were put into the system with the wrong tail number (typical), despite corrections given to each subsequent controller along the way. And so, we assumed the identity of N28481 for the day. We arrived at Schenectady County (KSCH), a towered airport home to general aviation and the National Guard. The military ramp was lined with C-130 cargo aircraft. The Bear spotted them from the air. "Look at THOSE big airplanes!" she shouted over the intercom. We landed on runway 28 in nine knot winds gusting to eighteen. We were directed to parking on the southwest ramp in view of the control tower by Hugh from Richmor Aviation. Hugh, a young pilot and aspiring aircraft owner, was assigned the task of driving The Bear and I over to the museum located on the north end of the field. There is aircraft parking adjacent to the museum; however, unlike the Air Zoo, there is no provision to get museum visitors through the security fence. That seems like a lost opportunity. The Air zoo had implemented a very manageable system that nevertheless complied with security needs. The Empire State Aerosciences Museum occupies a portion of the mammoth facility that once served as the General Electric Air Research Laboratory (this is a cool link with lots of vintage pictures, many of which were also displayed in the museum). The main hangar was a massive, concrete Quonset hut. Although the facility has been converted to other purposes and no obvious GE presence remained at the airport, Schenectady remains the home of General Electric's central research division. The GE connection is actually very fitting: most of the aircraft owned by the museum are jets and most of those used GE engines. This hangar was also home to my favorite sign of the day: "Warning - intermittent bird sounds in the hangar." From actual birds, no less. Before exploring the museum in earnest, we walked across the street to Manhattan Bagel for lunch. In addition to gaining sustenance, wackiness transpired as well. Nothing puts a smile on my little girl's face like a toasted blueberry bagel with cream cheese. And let me tell you, the folks at Manhattan Bagel are generous with the cream cheese. The first thing that greets visitors in the museum is a large map of New York state showing all the places that have impacted aviation. Indeed, New York's contributions are many, including Glenn Curtiss (Hammondsport, NY), Bell (Buffalo, NY), the Grumman Ironworks (Long Island, NY), Republic Aviation (Farmingdale, NY), and many other lesser known contributors. But I knew that The Bear would not find any of that interesting. Instead we used the map to trace our path across New York between Le Roy and Schenectady (above is our return GPS ground track). We touched on the Finger Lakes, naming them again (yup, Cayuga still earned giggles). The museum had a nice display on Amelia Earhart, about whom The Bear owns several books. We spent some time peering into the cockpit of a Lockheed similar to hers. We compared the copious number of instruments on that panel to those in Warrior 481. Then we looked at a 1920's era light aircraft and compared the number of instruments again (there were three). We also found an exhibit on everyone's favorite plum-clad aviatrix, Harriet Quimby. The Bear and I talked about what she accomplished and that she grew up south of Kalamazoo (Coldwater, to be specific - there's a plaque dedicated to her at the airport there). The Bear was unimpressed by her being the first woman to fly over the English Channel, but her eyes lit up in wonder at the mention of Kalamazoo. Go figure. Oddly enough, one of the things that most impressed me about the museum was not an airplane at all, but a massive scale model of the Japanese Aircraft carrier Akagi ("Red Castle") used in the filming of Tora! Tora! Tora! The model is so large (32' long) that an elevated viewing platform is provided for museum guests. This photo was taken from the platform. When standing on the floor, I was eye-level with the carrier deck. I wish my paycheck had as many zeroes on it as this aircraft carrier. Finally, we walked outside to the "Air Park". Outside displays of airplanes can sometimes be disappointing. Let's face it, Mother Nature can be dreadfully abusive. While all the airplanes sitting outside showed some signs of weathering, they were generally in good condition. Here are just a few examples. A nice A-4 Skyhawk against a beautiful eastern New York sky. This is a Republic F-105 Thunderchief. I always liked this name and thought it applicable to something considered the largest single-seat, single-engine combat aircraft ever built. This thing is big. I asked The Bear if we should paint a face like this one on Warrior 481. "Oh, Daddy. You're so funny." When I told The Bear that this A-10 was also known as the "warthog", she insisted on having her picture taken with the "Pumbaa" airplane. Hakuna matata! This was an interesting find. It is a North American RA-5C Vigilante. It is known as the largest airplane to operate from an aircraft carrier. It was designed and built to provide the Navy with aircraft-delivered nuclear strike capability, but later morphed into a reconnaissance aircraft. Only 130 of these airplanes were produced. The Bear was fascinated by the folding wings on this Grumman Intruder, so we talked about what the folding wings said about the airplane (carrier-based) and why. As I contemplated this Northrop F-5E Tiger, I was stuck by how svelte it was. It looked to me like a dragster. Just look at that wing; it's paper thin. It looks fast, but it also looks like it would fall out of the air like a lawn dart at speeds below 150 knots. At this point, the gusty winds (they were fifteen gusting to twenty-two by the time we departed) were making time in the Air Park uncomfortable, so were ventured back inside. While we were there, we met who I assume to be the director of the museum. He was very friendly and asked The Bear if she saw anything she liked at the museum. He had just returned from an event celebrating the donation of three aircraft from the Intrepid Air, Sea, and Space Museum in New York City (presumably to make room for the Enterprise). The aircraft were moved by barge, inaugurating the 2012 Erie Canal season a few days earlier than usual. After Hugh brought us back to Richmor (nice people there, by the way), The Bear snacked on some applesauce. The above photo is what I saw after paying the fuel bill. Way to class up the joint, little aviatrix! Once we got settled back into Warrior 481, a Cessna 152 taxied in next to us with a teenager in the left seat. That airplane was immediately surrounded by well-wishing family, so we waited for the celebration to move inside before cranking the engine. I'm not sure what aeronautical milestone we witnessed, but did not want to disrupt the special moment by starting up an airplane just a few feet away from everyone. This was our first visit to a large airport since the iFly 700 was upgraded to georeferenced FAA taxi diagrams. What a cool feature, to see the airplane moving along the diagram of an unfamiliar airport! Obviously, the above image is an overlay of our GPS track on a Google map, but it gets the idea across. On approach to Schenectady, we noticed the large ridge immediately west of runway 28 (plainly visible in the earlier photo). Given the gusty winds, I expected that it would throw some nasty bumps at us on departure. We were not disappointed. When it comes to turbulence, The Bear is a trooper. 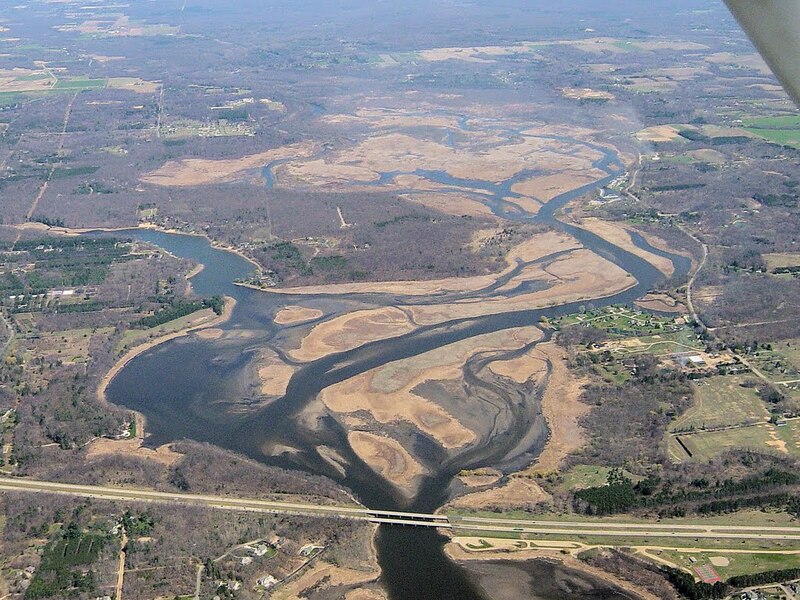 We flew over the Mohawk River on our way out of the area, the major tributary of the Hudson River and part of the Erie Canal system. We listened to a three way exchange between a trainee controller in Schenectady tower, a Piper Tripacer approaching from the east, and a Cessna approaching from the south. As the two airplanes converged toward the same runway, a more experienced controller stepped in and sorted out the near collision. The Bear sat back in first class, concentrating on the books, magazines, and electronic gadget I had packed to occupy her. There was no meal service on the way home, but headphones were provided to listen to in-flight entertainment. We paralleled I-90 for the entire route home. We climbed to 6500' to escape the bumps and flew home with a 20+ knot headwind. Although we could see snow capped peaks in the Adirondacks, much of the farm country below had transformed into a green promise of summer. En route to Le Roy, we flew closer to Syracuse than I had ever flown before. Here it is from over a mile up in the air. I have to confess, I only know two things about Syracuse: college basketball and that the original Dinosaur Barbeque is there. "Waterloo! Couldn't get away if I wanted to!" At this point, I just might have been getting a little punchy. Dan P, that one is dedicated to you. Overall, we had a good flight and enjoyed the museum. I think I have learned the key to long flights with The Bear when additional Bear wranglers are unavailable: a first aid kit, plenty of things to read (she went through about four High-Five magazines) and do (MobiGo, some activity books), and an adequate supply of snacks and water. Not too shabby - we can do this. Why is it that old airplanes present such unique personalities? Is it simply the cumulative total of unique experiences that fosters an individual temperament? If so, perhaps airplanes are more like human beings than many people realize. As a student, I trained at a flight school with a "fleet" comprising two Cessna 150s. The two airplanes each possessed distinct personalities. 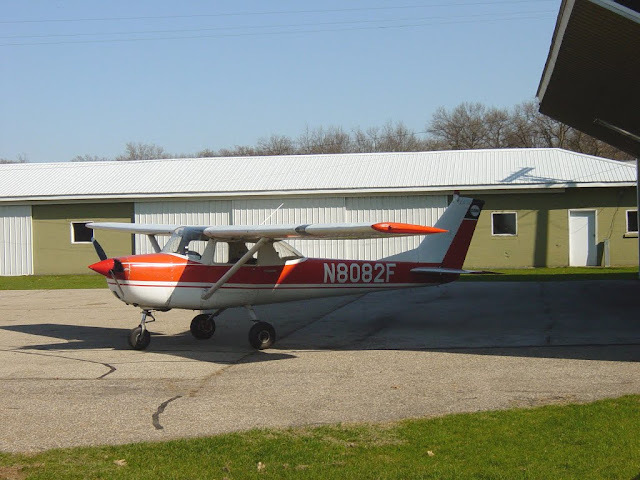 The newer of the two was N9327U, a 1976 Cessna 150-M. She had a decent twenty-foot paint job and was tightly rigged. Most renters preferred Two Seven Uniform because of her wonderful handling; she was an airplane that you could wear. Besides, you simply cannot go wrong with a blue and white paint scheme (ask me how I know). 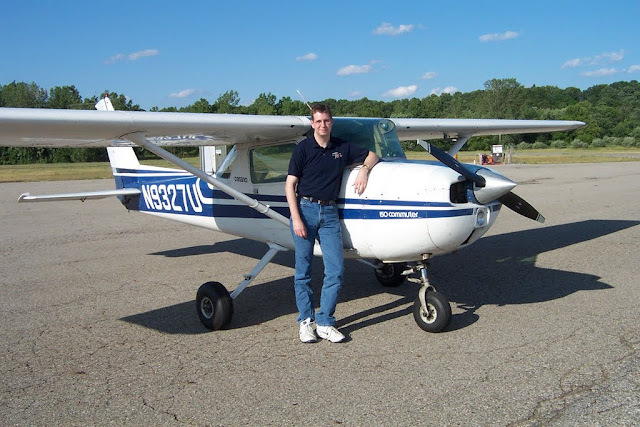 Two Seven Uniform was the airplane in which I soloed, performed my solo cross country flights, and flew for my check ride. June 29, 2003: With Two Seven Uniform at Jennison, MI. Photo by Scott. Two Seven Uniform had an older sister at the flight school, N8082F. 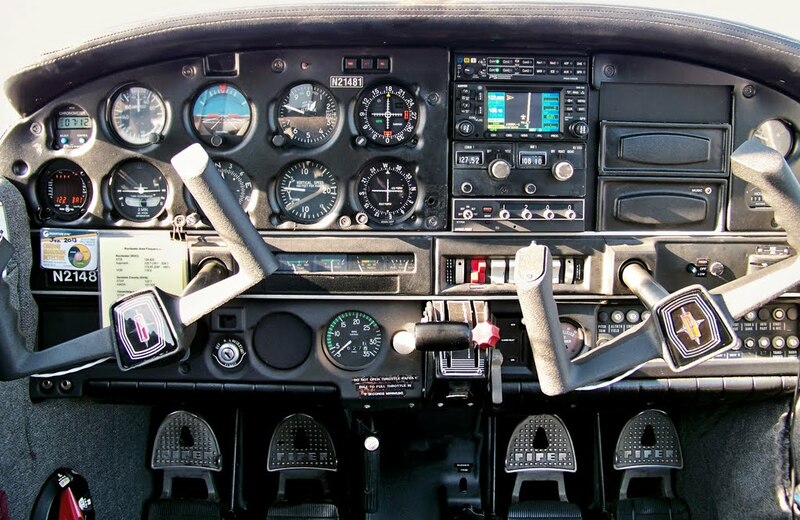 Eight Two Foxtrot was a 1966 Cessna 150-F that was often maligned by renters because her controls were not as tight as Two Seven Uniform's. This made her a little twitchier in winds, particularly for less experienced pilots (specifically, me). To my recollection, the orange 150 had two things over Two Seven Uniform: a nice directional gyro with very little tendency to precess and better cockpit glass (back when that actually referred to windows rather than the instrument panel). Otherwise, I associate Eight Two Fox with events like my first significant experience with spark plug fouling (following the transition from red 80 octane fuel to the ubiquitous blue 100LL) and the first time I truly frightened myself while at the controls of an airplane. I started off as a nervous student and, even though I soloed in September 2001, I did not attempt a solo training flight until December. I booked Two Seven Uniform, but she was down for unplanned maintenance and I was offered Eight Two Fox instead. I hesitated, but knew that I needed solo training time. The weather was fair and, though the winds were variable, they were also within my approved limits (10 knots or below). Eight Two Fox carried me into the sky over Three Rivers. I turned downwind for runway two three, flying over the middle of the reservoir (a wide spot in the St Joseph River). Final approach was a bit squirrely, but we wobbled our way down to the ground and managed a reasonable landing. As I flew, my confidence grew. Unfortunately, so did the wind. On the eighth landing, I was ill prepared to correct for the wind. With my lack of prowess and the slop in Eight Two Fox's controls, I fought the airplane and myself every bit as much as the wind. I landed hard on the downwind wheel and the airplane darted for the edge of the sixty foot wide runway. My feet danced on the rudder pedals and I belatedly threw full aileron into the wind. Eight Two Fox swerved and her tires squawked at me in anger. With toes on brakes, I applied steady pressure without locking the wheels until I fought her to a graceless stop without departing the runway. A beat passed and I realized that I was shaking. I had nearly lost control and wanted nothing more than to be out of the tiny cockpit and done for the day. But a little voice, deep down, shouted against taxiing Eight Two Fox back to the hangar in defeat. A part of me knew that if I walked away from the Three Rivers airport with that as my last landing, I might never come back. Still shaking, I back-taxied to the departure end of the runway, turned around, took a deep calming breath as I studied the windsock, and launched back into the sky. The ensuing landing was much better. Having faced down my fear and won, I decided it was time to wrap up for the day. My logbook describes this memorable flight with a matter of fact "pattern work". But the way I scrawled "N8082F" betrays how much my hand still shook when I wrote it. Fast forward to April 23, 2003. I was a certificated pilot looking for a respite from work. Flying can be immensely therapeutic because ground based worries tend to stay below while one focuses on flying the airplane. Eight Two Fox was the only airplane available for rent that day. Though I had been actively flying in recent weeks, my logbook indicated that six months had elapsed since my last flight in that airplane. That afternoon was one of my first photo flights and the first of many relaxing cruises along the shoreline of a Great Lake. 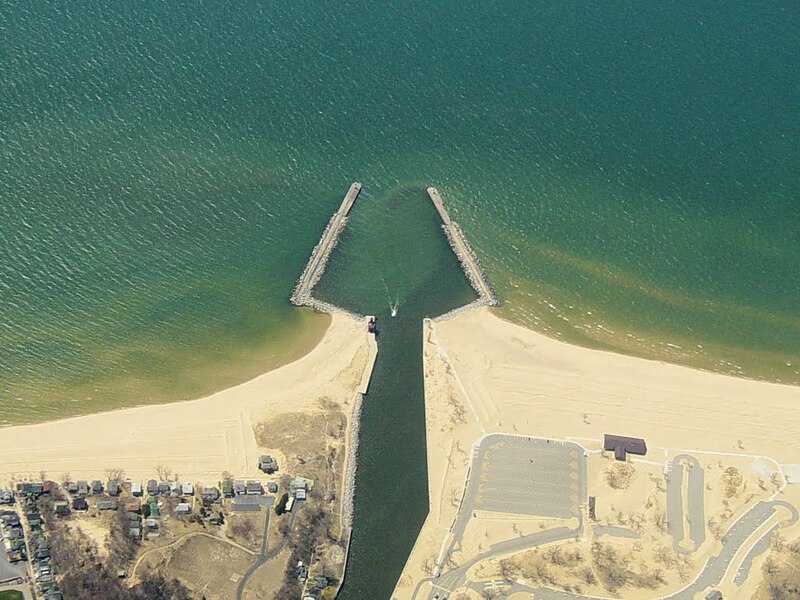 We departed Three Rivers and flew northwest to intercept the Lake Michigan shoreline at South Haven. I overflew the South Haven Area Regional Airport (0D1), which would later become my home base. 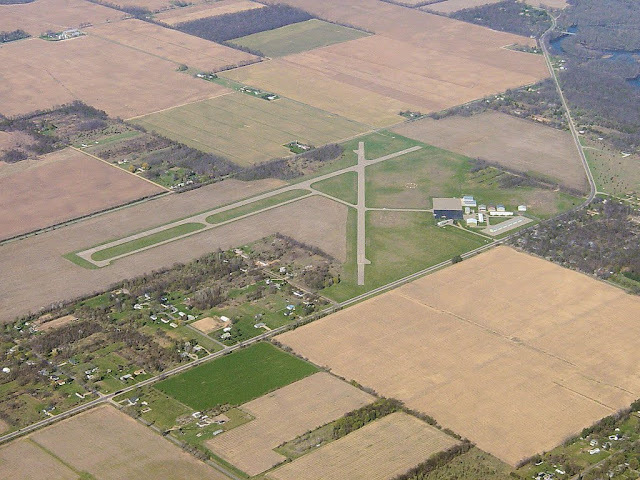 The green grass runway stood out in contrast against nonexistent April foliage. As a student, I never climbed above 3000'. For my flight west, I chose an altitude of 4500'. 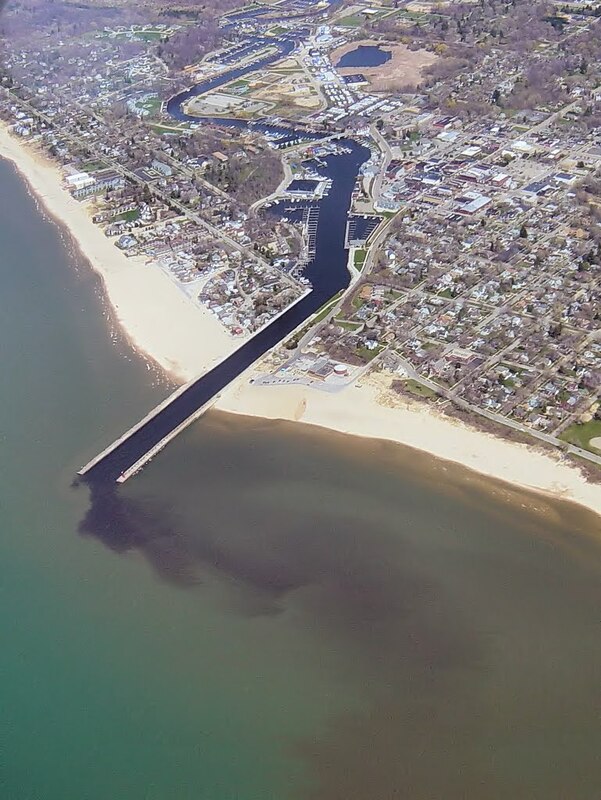 When I reached the shoreline, my "lofty" altitude revealed details that I had not observed before, like the plume of silt carried into Lake Michigan from the aptly named Black River. With the shoreline as my guide, I explored northbound past Saugatuck. As I flew, my worries diminished and my sense of inner peace returned. Eight Two Fox and I ended our wonderful flight by coming back to Earth gently. Though I returned to the same ground based worries that I had sought to escape, I brought back much of the inner peace imparted to me while aloft. I returned the airplane keys to the FBO, handing them directly to a student ready for some solo flight practice. Walking to my car, I stopped for a moment to contemplate Eight Two Fox. Now that I know what I'm doing, she's not such a bad old airplane after all, I realized. Fixed in the very spot where that thought occurred to me, I took my first and only photograph of Eight Two Fox without even bothering to frame it properly or seek better light. I assumed that there would be future opportunities. Not long after, on a morning that I volunteered at the Air Zoo, I was talking with another pilot who had a managerial role there. As pictures scrolled past on his computer screen, I saw one that was taken through an airplane windshield featuring some distinctive and familiar defects. "Were you flying Eight Two Foxtrot when you took that picture?" "Yup," responded Dale. "Too bad about the accident, huh?" It was a ground-handling mishap. A student was rolling out from landing in Eight Two Fox, lost directional control, and departed the runway. Obstacles beyond the runway edge are few, mostly runway lights and an occasional sign low to the ground. The student had the ill fortune to hit a sign. Eight Two Fox abruptly stopped, her nose gear sheared off, and she somersaulted over the sign and onto her back. Fortunately, the student was not physically injured, though I am certain that finding himself hanging upside down from his seat belt probably dealt a blow to his pride (well, that combined with wrecking an airplane). He was the very student to whom I had handed the keys at the conclusion of my shoreline cruise. The accident occurred within minutes of my departure from the airport. Eight Two Fox was a complete loss. The last time I saw her, she was a mangled mess tucked into the back of a hangar. It was disquieting, staring at the wreckage of an airplane in which I had logged 22.2 hours and knowing that I was the last pilot to successfully bring her to back to Earth. A wrecked airplane usually experiences one of two different fates. It may become someone's pet project, to be reborn and rise into the sky once more. More often than not, it becomes an organ donor and the rest of the carcass finds its way to a scrap yard. The latter path appeared to be the most likely for Eight Two Fox, whose delightfully stable directional gyro was transplanted into Two Seven Uniform. One of her wings reportedly became a decoration in the bar across the street from the Kalamazoo / Battle Creek International Airport. Believe it or not, I have 82 Foxtrot in my den. At least, part of her. It's an interesting story. Without further written explanation, the remaining tale of her unlikely resurrection was told by a series of pictures attached to the message. with what looked like a seat out of a Piper Cherokee. And so, November Eight Zero Eight Two Foxtrot lives on, the remains of a real airplane plying virtual skies. Tom has since posted a number of YouTube videos about the project. During the week of April 9, Warrior 481 went into the shop for annual inspection and upgrades. Initially, I wondered if we were going to make it at all. At 7:30 am Monday morning, we trudged westward to Batavia at 2500' against a 40 knot headwind. By midday, the large hangar housing Boshart Enterprises and Aircraft Services groaned in surface winds running at 30 knots, gusting to 40. I spent Monday and Tuesday assisting with the annual, which is always a great, educational, experience. The primary focus for 2012 was upgrading the panel. In the 21st century, a KX-170B navcom is the aeronautical equivalent of crow's feet: a sure sign of aging. With Garmin's venerable GNS-430 recently replaced by the whiz-bang touch screen GTN-650, I was able to get a good deal on a like-new 430W (built this century, no less!). The annual inspection was complete by midday on Tuesday. Everything was in good shape and compressions were all (76-78)/80. The avionics upgrade occurred over a longer timeframe. When I departed the shop Tuesday afternoon, the panel was still completely gutted right of the primary flight instruments. "Before" - The panel as it was configured prior to the panel remodel. When I returned on Friday (Friday the 13th mind you - a rather auspicious day to pick up an airplane from maintenance), it seemed to me as though I had a brand new panel. "After" - The remodeled panel. A close up of the radio stack and new CDI. From the outside, the differences are subtle. The old communications antenna once mounted over the cockpit is gone, replaced by the GPS/WAAS antenna. Missing entirely is the superfluous ADF antenna mounting right over the center of the cabin. A new communications antenna is installed on the belly, occupying the exact footprint of an old Northstar LORAN antenna that hadn't been attached to anything since 1999 (three cheers for no new holes in the airframe!). 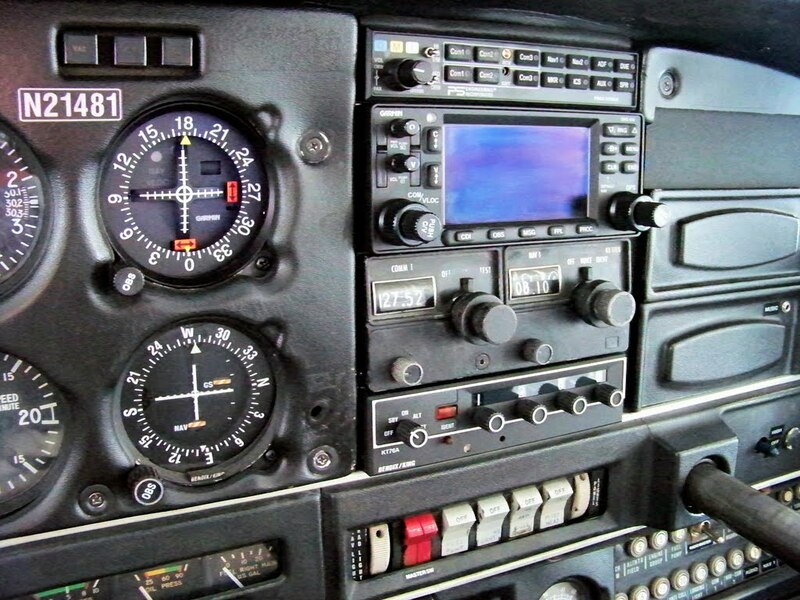 Inside, the most obvious change is the replacement of a KX-170B navcom (an early 1970's vintage box several years older than the airplane itself) with a Garmin GNS-430W moving map GPS / navcom. This gives Warrior 481 and I significantly more navigational capability, including IFR approaches for when I am qualified to perform such things. The non-functional Piper OEM clock was replaced by a digital Davtron M800 clock and timer. All avionics were consolidated into the center radio stack where having the transponder within convenient reach is a definite plus. The GNS-430 is mated to a Garmin GI-106A course deviation indicator (CDI) that bumped the previous #1 CDI, a King KI-209, to the #2 position. My previous #2 CDI, a sluggish old KI-208, is now relegated to desk ornament status. The displaced KX-170B is available to me as a backup navcom if the other one dies. With a static leak repaired under the panel, Warrior 481 traded in her VFR altimeter / transponder certification for an IFR certification. We are now ready for instrument training. I flew that evening, acclimating to the new equipment. The first thing I noticed: after flying with dual KX-170Bs for so long, the bright display of the 430 in the middle of the instrument panel was a little distracting. A little voice inside my head kept piping up with, "I wonder what it's doing now?". And, of course, I just had to look. My only prior flight experience with a 430 was in the Archer I rented while flying in the Rockies, but in that case, NOTHING could distract from the view outside. I am certain that I will get used to it, but I also know that I have a learning curve ahead of me. Thank goodness for Garmin's PC-based simulation software - a far less costly way to learn! This morning's mission was for The Bear to see her house from the air for the first time. The secondary mission was a $100 hamburger run to "Puddle Jumpers", the new restaurant that opened at the Oswego County Airport in Fulton, NY. Kristy, The Bear, my mom, and I all clambered aboard Warrior 481 for our excursion. 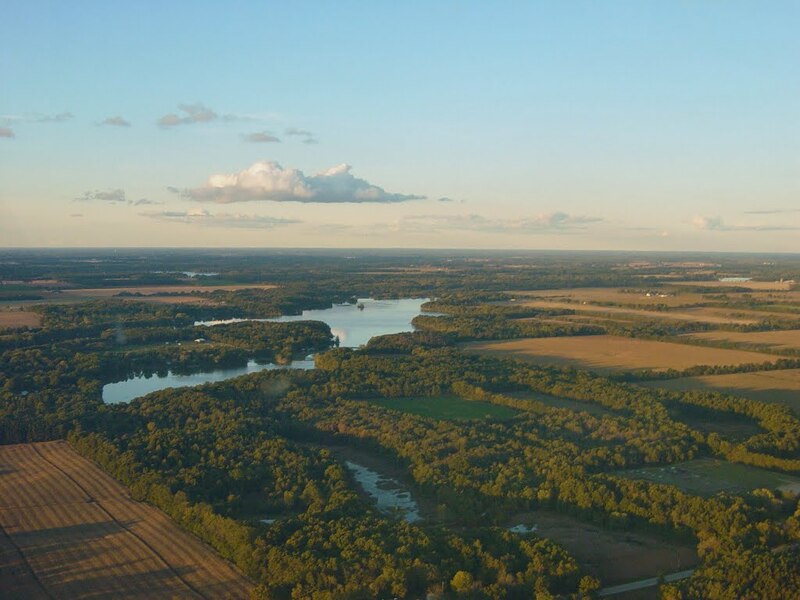 Cruising through Rochester's Charlie airspace at 2500 feet was a bumpy prospect. Nonetheless, The Bear happily called out seeing the Erie Canal, the city, and "her favorite bridge" (the arched Freddie-Sue crossing the Genesee River in downtown Rochester). As we bumped along closer to home, I spotted The Harley School where Kristy teaches and managed to get a decent photo between bumps. Upon reaching Irondequoit Bay, the air abruptly stilled. Nice. We reported to Rochester Approach that we were over our photo site and smoothly circled our home as The Bear cried out "I see our neighborhood! I see our house! I see the bay! I see the bridge!". The Bear's chalk driveway art was clearly visible as well as evidence that I mowed the lawn for the first time this year. The Bear decided that it was a lot of fun finding familiar things from the air! We turned eastward and flew past familiar landmarks like East Bay (above). 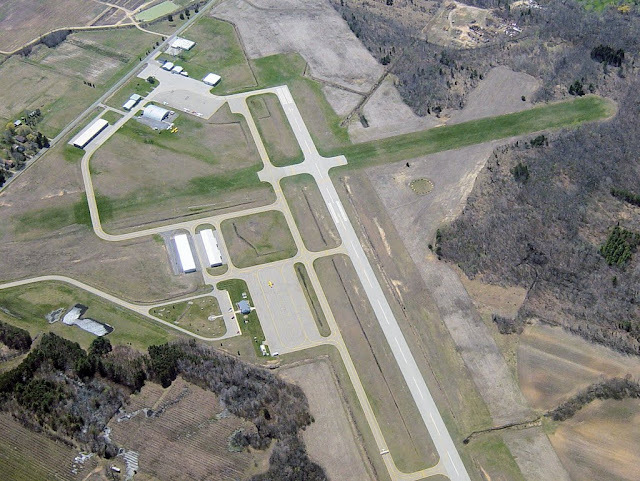 At 5500', the air was so smooth and the airplane so well-balanced that the remainder of the flight to Oswego County Airport was conducted hands-free. When I first moved to Upstate New York, Caroline's Restaurant at Oswego County was an institution. The restaurant was even mentioned positively in a Lauran Paine Jr article in Sport Aviation back in 2006 or 2007. But Caroline hung up her apron and got out of the airport diner business. A few other brave souls tried opening up in the same space, but none of them lasted. Puddle Jumpers had a simple menu. My hamburger was good, though my fries were a little too greasy. I really wanted to get the stuffed, half-pound mushroom-swiss burger, but after a big breakfast, I worried about weight and balance issues for the flight home. We also filled up with fuel - Oswego still has the cheapest fuel around - so we were heavy on departure anyway. Kristy and my mother enjoyed their sandwiches and The Bear had chicken fingers (which were probably not prepared on site). Nice touches at the restaurant included coloring books for kids, a large renovated bathroom (the old ones were tiny), and treats in plastic eggs as a tip of the hat to Easter. I am glad that someone opened up a new eatery on the field and I wish them luck. The Bear insisted on the front seat for the way home because of the better view. So we swapped things around and buckled her into place. As we climbed away from Oswego County, we passed through some wind shear strong enough to sound the stall warning horn while indicating 90 knots. The air calmed considerably over the lakeshore. After days of being churned by wind, sand particles suspended in the water closest to shore formed a halo along the coast. Strong winds made for interesting textural variations between Lake Ontario and water within Sodus Bay. All it takes is food, sunlight, and a few bumps and The Bear goes out. So much for enjoying the view from the front seat. I sure hope Kristy and Grandma were comfortable in the back! When we landed on runway 28 at Le Roy, the nearest station (10 miles west) was reporting winds out of 320° at 13 knots gusting to 23. The landing was good and I was glad that I spent part of the prior day practicing crosswind landings. The Bear did not awake until I gently removed her headset once stopped in front of our hangar. 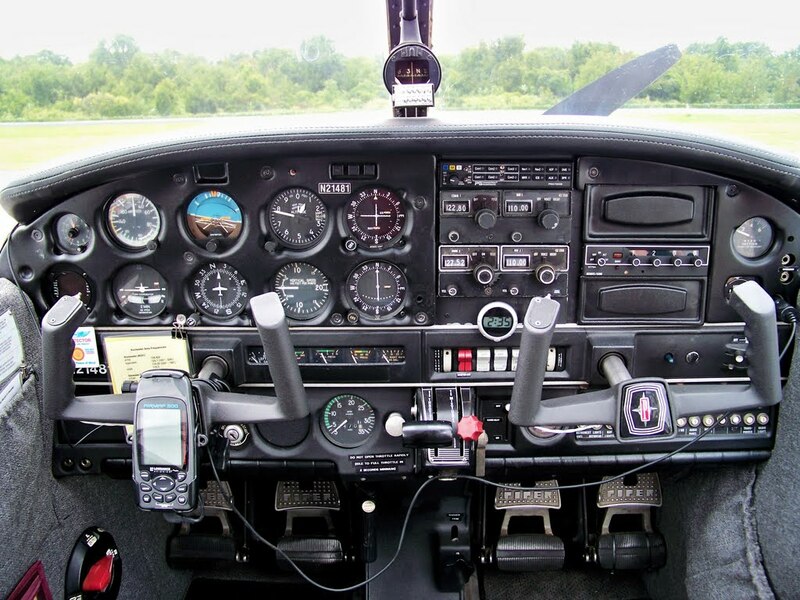 An instrument rated private pilot based at the Williamson-Sodus Airport (KSDC) in Upstate NY. A mile of runway will take you anywhere. "Someone Told Me It's All Happening at the Zoo"
All content copyright © 2001 - 2019. Awesome Inc. theme. Powered by Blogger.